Laker freshman student-athletes spend class time packing 200 bags for the local chapter of Blessings in a Backpack, which provides food to schoolchildren at risk of going hungry on weekends. 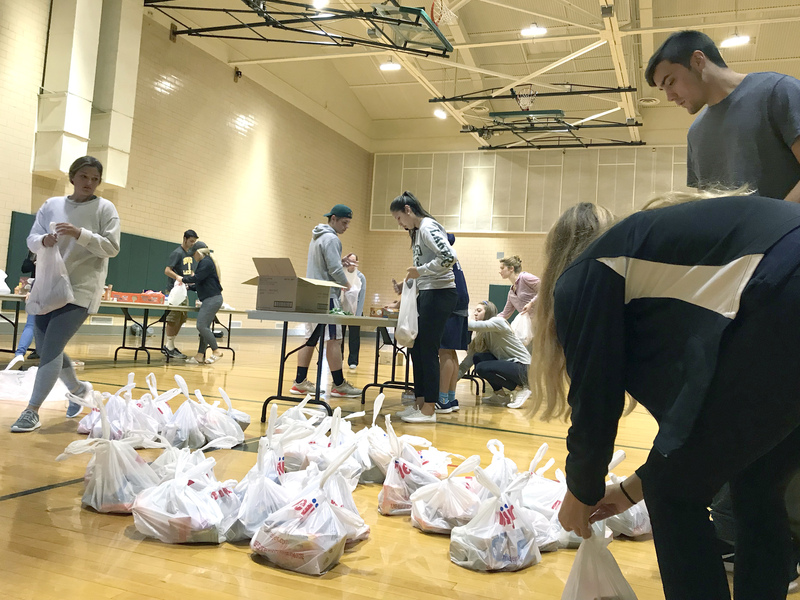 OSWEGO — Freshman student-athletes at SUNY Oswego recently packaged 200 bags of food for the local chapter of Blessings in a Backpack. The charitable cause is one of many that Laker teams and student-athletes support. Better test scores, improved reading skills, positive behavior, improved health and increased attendance have all been attributed to the success of Blessings in a Backpack, Witmer noted. In providing feedback on their assignment, student quotes included: “Knowing that I was going to be helping children in need was a really rewarding feeling,” “It is really cool to see what people can do when they come together as one and help each other out” and “I had a really good time and would hope to do something like this activity in the future,” Witmer said.